Llewellyn, spelled in the British way, was a member of a family that stayed on at Woodlands after the Civil War. She was “sent up” from Woodlands to Greenville, SC to work for my grandmother. Llewellyn was a descendant in the line of the Rowe family, who were slaves on property my family owned before the Revolutionary War. Rowe was also the name of one of our 18th century ancestors. Our grandmother, Mary Chevillette Simms Oliphant, was an historian and author and very much focused on her career. Llewellyn practically raised Simms’s father, the baby of the family. I remember Llewellyn doted on him even as an adult. In the interview, Simms calls Llewellyn his second grandmother. 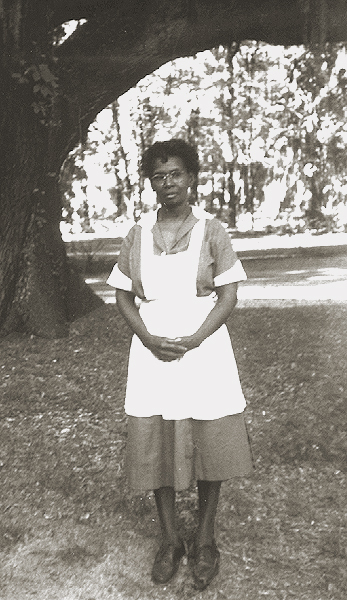 My mother told me that she overheard my grandmother once say, “Mother [my great grandmother] gave Llewellyn to me as a wedding present,” a statement revealing my families early 20th century view that slavery was not quite over at Woodlands. The arrangement between my grandmother and Llewellyn’s father, who was sharecropping on the Woodlands property, was that my grandmother would send part of Llewellyn’s salary back to Bamberg to help take care of Llewellyn’s children, who were raised by Llewellyn’s parents. Her children were conceived in Greenville, when Llewellyn visited Greenville to work for my grandmother in the summers. In the interview, Simms refers to our grandmother as “Miss May,” a name given to her by Llewellyn and used by family and friends alike. Although Llewellyn was considered “just like family,” she didn’t have the privileges and opportunities available to my family. She couldn’t read and write. (My mother told me that my grandmother had hired a tutor to teach her but that she couldn’t learn.) She wore a lace apron over a black dress and a little starched lace “crown.” We all got along because Llewellyn stayed in her place, which allowed us to maintain our love and affection for her; it was a flawed but valued connection—at least to us. It seemed to me that one of her outlets was to gripe and nag sotto voce to anyone within hearing distance. She used to say with pride, “I’ve been with the Simms family for 300 years,” a statement that still haunts me today. Completely wonderful. Thanks for posting this. I’ve been missing the Just Like Family posts lately. Wow. That last line about knocked me to my knees. You are currently reading Llewellyn at JUST LIKE FAMILY.